Second only to the beloved tree, the family mantel is the place for signature style. Here’s how scrapbook designer and blogger Marie Ramirez incorporated easy crafts and flea market finds into a budget-friendly display you can try at home this holiday season. Key Ingredients: Paper crafts, fairy lights, string lights and vintage Christmas cards. Putting it together: “I used a lot of handmade elements and vintage finds,” Marie says. Layers of paper garlands, white beads and a paper banner create texture and dimension. A tinsel wreath and ’50s-style Santa calendar add retro appeal. 1. Play with reflections: Marie has placed the wreath on top of the mantelpiece mirror so that the reflected Christmas tree’s tip is visible at the center of the wreath. The mirror also reflects her weathered wood “Keep Calm and Carry On” sign, which, while not inherently Christmas-y, sports a turquoise hue that works well with the vintage Christmas theme. 2. 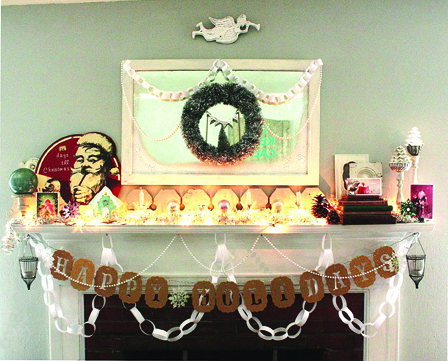 Layer different elements to reinforce shape and texture: Hanging from the mantelpiece are four sets of Christmas streamers: white beads, a paper chain, strung snowflake ornaments and a “Happy Holidays” banner. Above, white tinsel, candles, Christmas balls and vintage cards repeat the same shapes and textures as the elements below. 3. Bring nature in: Don’t forget to include natural pine cones and a pine-bough wreath in your mantel vignette. Your flea marketing efforts help keep reusable items out of landfills, hence reducing pollution and preserving natural resources; show off your love for the earth by referencing it in your decor. 4. Arrange your pieces to create symmetry: On this mantelpiece, tall antique candlesticks on the right balance out the vintage Santa sign on the left. The mirror and the angel above allow the vignette to taper into a point, creating a well-balanced triangular shape. 5. Have fun! Play around with whimsical elements and observe their effects on your vignette. 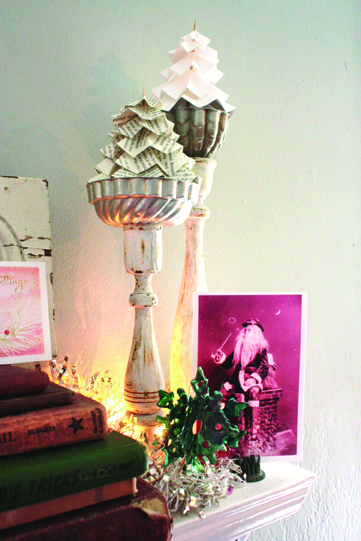 Marie’s handmade, miniature paper trees, for instance, replace candles atop the antique candlesticks for a quirky look. Try incorporating candy canes, your Depression-era glass collection, miniature birds, a vintage mason jar of twine, last year’s present tags, faux berries, handmade stockings, vintage lanterns or your child’s artwork. This entry was posted in Decor Inspiration and tagged angel, Antiques, beads, candlesticks, Christmas, Christmas decor, Christmas decorations, Collectible, Collectibles, Collections, crafts, DÃ©cor Ideas, dÃƒÂ©cor, Displays, DIY, easy, easy projects, fireplace, flea market, Flea Market DÃ©cor, garland, handmade, holiday, holiday decorations, homemade, mantel, mantelpiece, projects, repurpose, retro, santa claus, streamer, vintage, vintage Christmas cards, vintage sign, winter by Flea Market Decor. Bookmark the permalink.